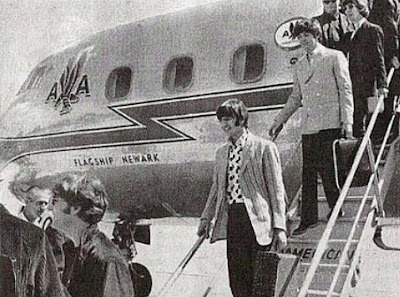 The Beatles were nervous when they landed in Memphis, TN on August 19, 1966 and for good reason. If something dangerous was going to happen as a result of John's "Jesus statement," Memphis was where it was going to happen because it was the only southern city on the tour. George was heard saying, "Send John out first, He’s the one they want." And as you see by the photo, John did indeed exit the plane first. "Send out John first, he's the one they want." Love that very typical barbed Liverpool wit. And fabulous photos unearthed in this series.